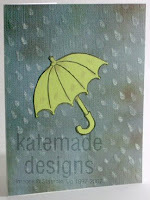 Katemade Designs: What is a Cuttlebug? My friend Cali asked "What is a Cuttlebug?" So I thought I would answer her here instead of a direct email because some of my other readers are not paper crafters or are new paper crafters and they need to know too. The Cuttlebug is a die-cutting/embossing tool by Provo Craft. It is designed to make cutting dies and embossing easy, and boy did they succeed. It's very lightweight, at only 7 pounds, and easily portable because it has a built in handle on top. The sides, that you run the dies or embossing folders through, fold up so it is quite small - which is important in my small and now overcrowded craft room. I've been experimenting with what can go through this machine. It says it will work with any other manufacturers dies and so far it has. I have only one QuicKuts die, a discounted experiment, that worked great. I own several Sizzlits dies from Sizzix, as well as one of their Bigz dies from Stampin' Up! and all go through the machine fine. you do need to buy the dies that you want to cut with or the textured folders/plates that you want to emboss with. The costs of these can vary widely. I troll the clearance aisle or discount bins at the big box craft stores for dies and occasionally find something I can make work in projects I have on the horizon. I also use the 40% OFF Coupons they offer for the more versatile dies like circles, scalloped circles etc from Spellbinders. What is the difference between a Cricut and Cuttlebug? I'm new at crafting. Thanks for your help in advance. Yolie I don't have an email for you so I will answer your question here. The Cricut is an electronic cutting machine made by ProvoCraft. There are several versions of the machine now but the first models required cartridges to cut designs. The Cuttlebug is also made by ProvoCraft and is now marketed as the Cricut Cuttlebug. This machine can cut shapes using steel dies and emboss papers using embossing folders. The price on the Cuttlebug starts at $69.99 according to the Cricut website. Those 40% off coupons you get for Micheals, Hobby Lobby, and JoAnns will generally be honored for these machines. The cheapest Cricut on the other hand has an MSRP of $249.99. At this writing (11/5/15) the website is sellilng this unite, the Cricut Explore One™ for $199.99. The big box craft stores will not let you use coupons on these machines. However you can catch great sales around Black Friday. I do not use a Cricut, I am a Silhouette girl. 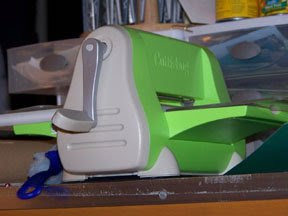 Many of the new features of the Cricut were copied from the Silhouette business model of selling individual cut files online. Many of the innovations I see in the Silhouette now are available in the Cricut. I have tutorials on this blog for the Silhouette. Happy Crafting Yolie, and everyone else.